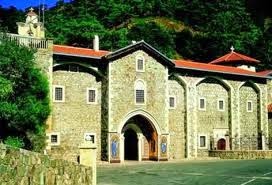 ABC Wednesday: K stands for The Kykkos Monastery Cyprus. 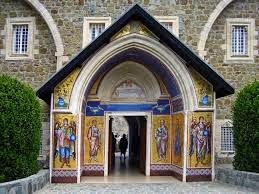 During one of our many holidays on the sunny Island of Cyprus in the Eastern Mediterranean we visited The Kykkos Monastery up in the Troodos mountains. 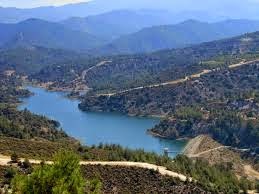 At the time we were staying at the popular Paphos area, you will see Paphos on the bottom left of the map and The Troodos Mountains, nearby where The Kykkos Monastery is situated. Outer entrance to the monastery. Inner court entrance to the monastery. A row of icons where people line up an make their pleas then kiss the icon. We stopped at this mountain village, (on the left) for lunch, view to the right from where we were sitting. Throughout the centuries the village people in the mountains have revered the icon and have attributed miracles to it's presence. 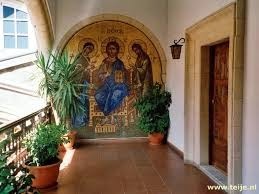 It is said St Luke the Apostle painted and carried it from the Emperor's Palace in Constantinople at his request to place it on the site where the new Kykkos Monastery was to be commemorated. 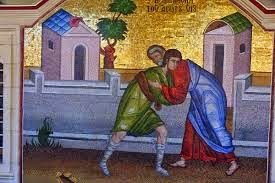 St Luke carrying the icon. There is a lot of folk lore associated with the 'icon of The Virgin Mary', but time and space disallows me from writing more, but good old 'Mr Wikpedia' is bustin' at the seams with reams of it should you require to read further! My thanks to the KINDLY Denise for devising ABCW and Roger the KEYSTONE admin man for KEEPING us on our toes. What a wonderful place to visit. So much history. Thanks for the intro to K, Trubes!! Hi Ellen, thanks for your kind words, It truly is a wonderful place to visit, there is so much more to tell, which, hopefully I will be able to at a later date! Thanks for this inspirartional piece, Di. The Greeks' icons have such deeply rich colors- so different from the soft colors we have in our parish church. 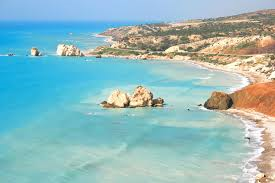 but in their cuisine too, wonderful places to visit. I read about icons in an earlier post by you, I think. This Monastery looks absolutely regal. The ones I've seen earlier were much more stark. to create such wonderful scenes bristling with so many rich colours. Nice! Adding it to my "to do/to see" list. 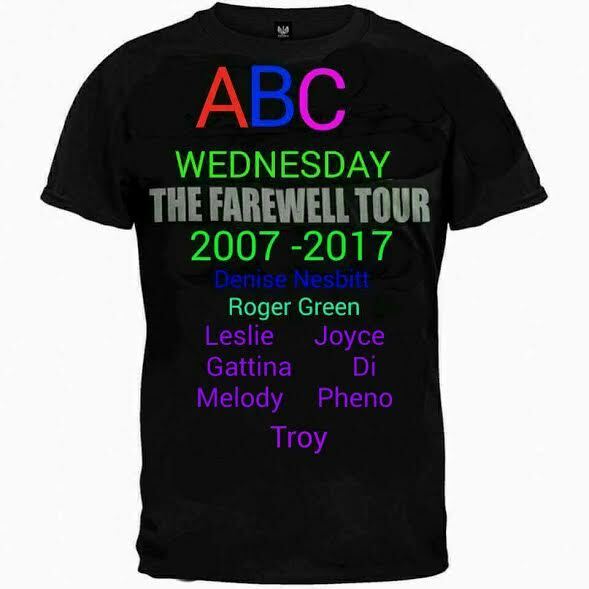 Thank you to the entire ABCWednesday team. Have a great week. well worth a visit, and the trip up the mountains too, stunning scenery along the way. I love iconography, and have painted 5 plus one that's a work in progress. They're not just beautiful and inspirational to look at, but the process of working on them is very reflective. Blessings! Hello Ronoldo, good to hear from you again. I thought I may have seen an icon amongst your art work, I must pop over to your site and take another look! Thanks for this informative post. The icons look beautiful. Oh wow! Didn't know monasteries could hold such treasures inside! quite a shock when we got inside, so breathtakingly beautiful. Chris - Trubes has no control over the links . I put in the code. I have noticed periodically - not just this week - that sometimes they are slow loading, but I don't know if that's a function of the Linky company or my slow computer! Truly Gattina , it was a wonderful day out. Thanks Anita glad you enjoyed it. Great post, and of course very topical for Lady Day, March 25. 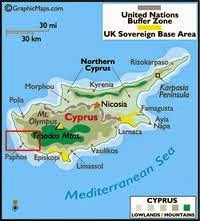 Also, not forgetting that Cyprus in Greek is ΚΥΠΡΟΣ and in Turkish KIBRIS. My "K" post is for KAYSERSBERG in France. Thanks for hosting. So sad the Greeks and the Turks still don't like each other, such lovely people too! Glad you like it, I shall have to go searching for a key Now ! Very interesting! 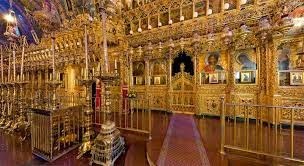 Opulence is so contrary to a vow of poverty, seemingly more so in a monastery. Su-sieee, I quite agree, but then it is a money making machine. The monks don't need worldly goods, they are totally self sufficient, farming their own land etc. They do, I believe have a vinery and make honey. It would be interesting to know where the proceeds of the monies raised go. I imagine a lot would be required to maintain the building etc. You have brought back memories from my visit there. and a bit hair raising too! Looks like a very pretty place, tho I never been there in person and just reading about it, it is so full of a rich history, thank you for sharing. Fritz Ant, Thanks for dropping by and your kind comments. The history of the place is amazing and I will write more when the right letter or thought appears! Interesting and beautiful place to visit. What gorgeous photos! Must have been such an interesting place to visit. Thanks Beverley, it was a most interesting place, we spent a day there and could really have spent longer.